See Anna Hopfensberger’s debut show. Anna’s paintings are being displayed at Art Basel as part of The Artbox.Project Basel 1.0. This programme, organised in conjunction with The Artbox.Gallery, Switzerland, moves around the world, stopping at the best international art locations to promote the artworks of emerging artists. The artworks of Anna Hopfensberger will be displayed on a giant screen at EuroAirport Basel-Mulhouse-Freiburg as part of Art Basel. 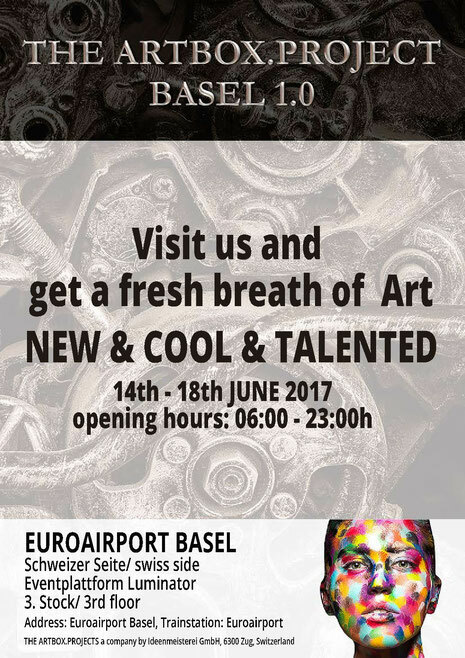 Approximately 90,000 Art Basel visitors will pass through EuroAirport this year. If you’re one of them, look out for Anna’s work on the big screen near the prominent installation of the sculpture ‘Luminator’ by Swiss artist, Jean Tinguely. The international airport is just 3.5 km from Basel, Switzerland. Located in the Upper Rhine region of France, travellers can cross the border into Switzerland within the airport. The Art Basel exhibition screen is located on the Event Platform in the Swiss side of the airport. The screen measures 300m² so you definitely won’t miss it!